This article, which was originally published in The Ergonomics Report, reviews the evolution of an ergonomics process that was developed and promoted internally by Keith Osborne, a Honeywell HSE specialist. The process took some years to build, and Osborne shares how he won early successes that were used to gain management support and grow the benefits and value of ergonomics, and how he leveraged success to continuously improve and grow the process. The program now produces a significant ROI, helped gain the site OSHA VPP Star status, and has been adopted as a Honeywell best practice. Keith Osborne retired from the US Army due in part to a back injury he received in the line of duty. He had no formal ergonomics training at the time, but as is often the case, his back injury forced a new perspective that led him to not only discover its benefits, but to build an award winning ergonomics process that has since benefited many of his coworkers, become a Honeywell best practice, helped earn OSHA VPP Star status, and earned him a President’s Award for HSE. The process began in 2003 when he joined a Colorado Springs based Honeywell division that manages a Satellite Control Network Contract for the US Air Force. Between 2003 and 2005 the facility experienced an average of 7-10 Work-Related Musculoskeletal Disorders (WMSDs) per month, with 80% of those resulting in lost time. Keith observed the trends and began to take a greater role in accommodating the ergonomics-related concerns, helping to lower the injury rate to 4-5 WMSDs/mo. With little or no management support, an ergonomics program was officially started in 2006. As is often the case, management was initially very skeptical of the value ergonomics might bring, and they viewed it as a cost center, not an opportunity for business improvement. Initial barriers centered on whether the solutions brought forward through ergonomics would produce returns on investment (ROI), and regardless, who’s budget(s) project expenses or capital purchases would come from. At the start, any action required a Doctor’s note, and no one had any formal ergonomics training, making this type of reactive approach ineffective. In 2007, Keith officially took over the ergonomics program and started by implementing a formal process to provide workstation assessments, primarily for office environments. Keith attended an Ergoweb training course where he met others facing the same challenges, and where he learned the basics of ergonomics, ergonomics program design, assessment methodologies, solution implementation, and a variety of skills that helped him demonstrate some early successes that gained management’s attention. Success didn’t come easy, though, as these types of reactive, case-by-case workstation assessments and accommodations were time consuming, and corrective actions were slow to be implemented with no budget and no inventory of devices/products that were needed to make workstation improvements. Further, a lack of formal metric evidence to support ergonomic improvements resulted in some push-back from management. Keith began to gain noticeable traction with his efforts in 2008. He was able to get the Doctor’s note requirement dropped; he was able to inventory some equipment, making solutions immediately accessible; and, he was able to improve the response time for corrective actions from weeks to days. He even gained support from previously skeptical management when he was able to help the Program Manager (essentially the highest manager at his facility) and the Chief Financial Officer correct ergonomics problems at their own workstation. Other managers began to support the program following their own assessments. Management really took notice, however, when the WMSD rates fell to 2/mo. They soon took an even greater interest in Keith’s work, because in 2009, there were only 5 WMSD events for the entire year. In 3-4 years, he was able to build a process that reduced WMSD rates from 7-10/mo. down to 5 for the entire year (2009). 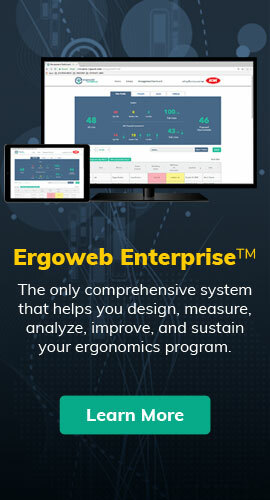 That is, by moving the ergonomics process from an entirely reactive approach to a proactive approach, the company estimates that at least $1.25 million in direct and indirect medical costs have been saved in 2011 alone, and there are more savings to come the process continues to improve. Equipment costs have been relatively low, averaging around $50,000 per year. Keith is also working to come up with savings related to improved productivity and quality metrics, reduced absenteeism and turnover, improved morale, and any other benefits he can tie to the ergonomics process. For the past 4 years there have been no lost time or Workers Comp claims attributable to WMSDs, and there have been no WMSD events whatsoever since the beginning of 2010. ZERO is another number management understands and respects, and it also caught the eye of OSHA and the VPP program, helping Keith win the President’s Award for HSE. One unexpected benefit that has emerged from his recordkeeping is good intelligence as to which workstation equipment and input devices are effective, and which are not. Another unexpected “win” that has helped fuel the acceptance and spread of the program, and sit-to-stand, active workstations in particular, are the cyber training kiosks he had installed in the training room. There are three kiosks: a sit-to-stand workstation, a recumbent bike workstation, and a treadmill workstation. Each is fitted with adjustable work surfaces, monitor arms, left and right handed mice, keyboards and chairs, and each therefore functions as a good demonstration of flexible, user adjustable workstation technology. Total investment cost was $7,000, and the workstations have led to a 30% increase in on-time training completion since the room was built in August 2011. The popularity of the kiosks has created a back-log, and employees must now request “training appointments” to access the workstations. User experience with the sit-to-stand technologies has also expanded awareness and caused an increase in requests from employees to transition from seated stations to sit-to-stand stations. Keith integrated the wellness component at Honeywell to extend the benefits of the ergonomics process (he is also a Master Fitness Trainer). Participation in the Wellness room is voluntary, and to date, 520 of the 750 site employees have signed up to use the 1100sqft fitness facility within the building facility, with more than 75 of those individuals receiving a customized exercise program; 35-40 employees now use the company sponsored onsite facility each day. The room contains several different stae of the art cardio machines and a wide variety of free weights, weight macines,and non-standard fitness tools (kettlebells, TRX, Exercise Bands, etc.). As he built the ergonomics process and worked to gain management support, Keith was a “one man show,” performing all aspects of the process on his own. Due to the success of this program, he is now training two additional assistants who will help him carryout the process. He is also expanding the process to include non-office environments, and expects to gain additional success and support as he proves the value of ergonomics as a business improvement strategy for Honeywell. This article originally appeared in The Ergonomics Report™ on 2011-12-06.